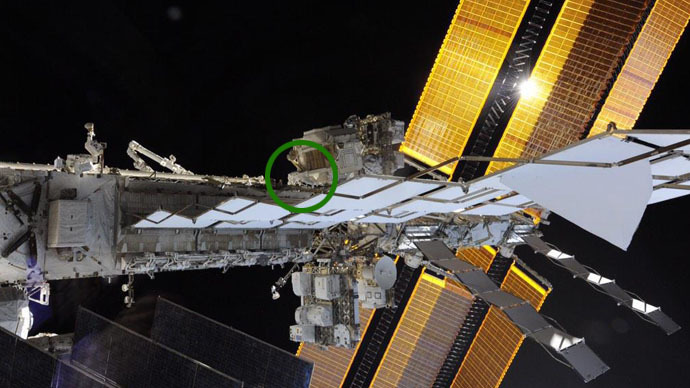 A rare photo taken by ISS flight engineer, Terry Virts, during his third and final spacewalk has captured the real grandeur of the International Space Station, with station commander Barry “Butch” Wilmore barely visible in the awesome shot. Spacewalkers Virts and Wilmore completed their third spacewalk in eight days on Sunday, to rig new docking spots. The astronauts celebrated 100 days in space with a "Day 100 badge." They've only got two and a half months to go and time is flying "way too fast," Virts complained on Twitter. The challenge was to prepare berths for spaceships developed by Boeing and SpaceX. They had to install over 122 meters of cables, a pair of antennas and reflectors the new spaceships will navigate toward and dock with the station, a $100-billion laboratory about 418 kilometers above Earth. The astronauts were expected to spend up to seven hours on their mission. Instead, the savvy astronauts were back inside the space station in 5 and a half hours. Their three outings spanned 19 hours, over which time they installed over 240 meters of cable and several antennas. After the spacewalk, Virts said that a small amount of water had seeped into his helmet. According to mission commentator Daniel Huot, it was "no issue to crew safety." In 2013, death was just a breath away for Italian astronaut Luca Parmitano who nearly drowned when water began leaking into his helmet. NASA immediately aborted the mission and suspended spacewalks while engineers tackled the problem. NASA said the incident with the suit Virts was wearing is unrelated. In an effort to stop being reliant on the Russian Space Agency, NASA has hired Boeing and SpaceX to develop spacecraft capable of transporting astronauts to the space station. The two contracts are worth nearly $7 billion. However, NASA will buy Russian Soyuz seats for its astronauts through 2018 in case the two companies miss their promised 2017 launch deadline. The first man to walk in space was Soviet cosmonaut Alexei Leonov, on March 18, 1965. He beat America's first spacewalker, Edward White II, by just over two months. Leonov’s pioneering walk nearly cost him his life. After 12 minutes on the outside of the spacecraft, as he received the order to return, the cosmonaut realized something was wrong. Lack of atmospheric pressure had caused his spacesuit to inflate like a balloon, so he couldn't get back inside the capsule. Leonov acted fast and siphoned off fifty percent of the air in his spacesuit, although this risked starving his own body of oxygen. The cosmonaut was supposed to re-enter the craft feet first, but he "did it his way" - head-first. He then had to turn himself around in a tiny tight space to pull in the "umbilical cord," which had kept him from falling off into space.